Now Is Your Chance: A 30-Day Guide to Living Your Happiest Life Using Positive Psychology. If you’ve vowed to start 2018 by being as positive and happy as you possibly can, then I would definitely recommend you give this book a read. Usually self help books don’t appeal to me as I seem to have a pre-determined view of them being extremely boring and not something that I would interested in. But after hearing so many great things about this book, I was definitely impressed. One thing that I absolutely love about this book is that fact that you only need to read a chapter a day. It’s the perfect for your journey to work, or even on your lunch break. Each chapter gives you a new challenge to follow, allowing you to gently bring the tips and values into your everyday life. I would recommend you keep a notepad handy whilst reading this book as it’s very interactive and it definitely keeps your brain awake. It encourages self worth and really helps you remember to think positive and enjoy your life to the full. This book alone has definitely gave me a new outlook on life and you can definitely see an improvement in your own thoughts just through the first couple of chapters. If you’re thinking of picking up a new book, then I would definitely recommend you check this one out. I have recently tried out a new brow product which I am really impressed with, so I thought that I would share it with you in hopes that you love it as much as I do. Throughout the past few years I have tried and tested many brow products, some great and some not so great. One of the main issues I have when finding a brow product is that it seems to be hard to find the perfect shade. With that in mind, I was excited to try out the Universal Pencil by Billion Dollar Brows, as it states that it is a brow pencil suitable for all hair colours and skin tones. The pencil features a spoolie brush on the end which is amazing as it helps you blend the product beautifully. I was so impressed with how easy the product was to apply, with a few light brush like strokes I was able to create the perfect look. The product is very buildable, which is helpful in creating the right shade and tone to match your hair colour. I also like the fact that the pencil does not need sharpening as it uses a retractable tip pencil. This is my end result after the using the product. I was pleased to find that the colour did not fade or smudge, leaving me with a natural brows for hours. My Favourite Body Shop Skincare Products! I recently stocked up on my favourite skincare products and decided to share them with you guys. I love The Body Shop, which is reflected on the fact that nearly all of my skincare products are purchased from there. Here is a quick run down of my favourite products from The Body Shop. The Body Shop – Tea Tree Mattifying Lotion. This product is perfect for when your skin is looking oily, shiny and full of blemishes. After just one just this product you can definitely see the results. It reduces pore size and leaves your skin looking fresh and ready to go. The Body Shop – Tea Tree Pore Minimiser. This products works wonders when used with the Tea Tree Mattifying Lotion. The Pore Minimiser does exactly what it says on the bottle and minimises any pores you have. I also use this product as a primer before applying my makeup and it really does keep everything in tact. The Body Shop – Vitamin E Moisture Cream. This face cream is my go-to product when my skin is feeling dull and dry. I use this product both day and night, leaving my skin feeling hydrated and refreshed. The product itself isn’t too heavy on the skin which I love. It doesn’t make your skin break out either which is always a plus! The Body Shop – Tea Tree Skin Clearing Clay Mask. If you’ve read any of my previous posts you will know how much I love this product. I make sure I use it at least once a week, as the results are incredible! If you’re having a breakout just in time for an important event (which always seems to be the case for me), then I would definitely recommend you purchase this product. I guarantee that you will see the results over night. It has definitely helped me out in the past and I will continue to purchase this product until I die! 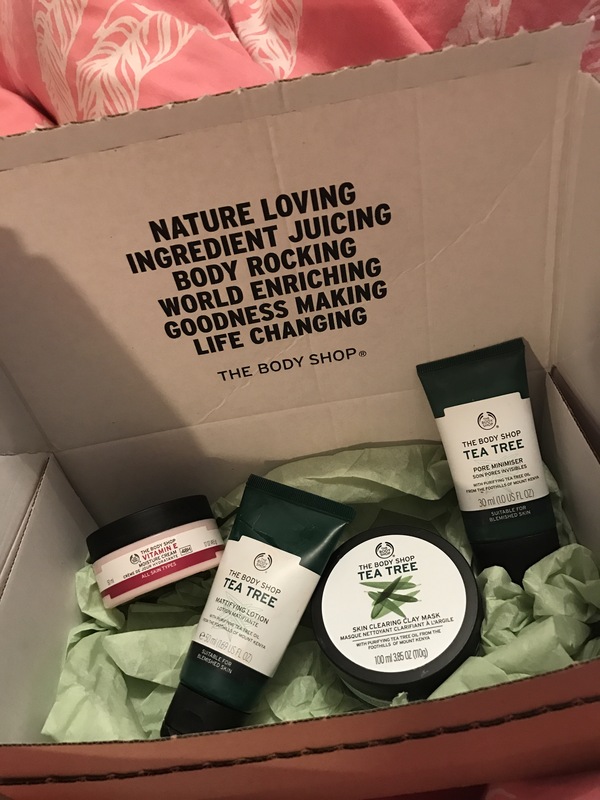 I hope you’ve enjoyed this post and it would be great to hear what other products you enjoy from The Body Shop! I have always been a huge fan of tea, which is why I was so excited when this package finally arrived. Tea sold by teakruthi is hand picked and ethically sourced from the world’s finest plantation in Sri Lanka. The tea they provide has no artificial or genetically modified organisms, leaving it incredibly natural and good for you. As teakruthi delivers their tea direct from the plantation to your doorstep in less than three months, there’s no wonder why it tastes so refreshing. After reading about this brand of tea online I went ahead and ordered some to try out for myself. I decided to try out the Zen Mint and Mythical Green tea. The tea is loose, but when you buy a bag you also receive a infuser which is amazing. Zen Mint is the perfect tea to start the day as the strong mint aroma will definitely get you moving in the morning. Zen Mint is also great to drink after a meal as it leaves you with a refreshing taste and settles your stomach. Mythical Green is also a refreshing tea and I tend to drink this on my breaks at work as it gives you a boost of energy throughout the day. As the tea is loose you can decide how strong you like it, as I know not everybody enjoys the taste of a strong green tea. I enjoy my tea very strong, so I tend to leave the infuser in for a good 3-5 minutes. I did taste the tea at all stages and it was incredible throughout them all, so if you’re somebody who doesn’t like tea too strong then this would be great for you. If you’re looking to start your new year with a new refreshing tea, then I would definitely recommend that you check out tearuthi as there is a wide range of teas to suit all tastes.